Krone’s Multibale system gives you benefits of small bales with the added bonus of being able to quickly and easily distribute them from the field. The length of the entire bale as well as the number of small bales can be set conveniently and simply by the Operatory in the cabin. 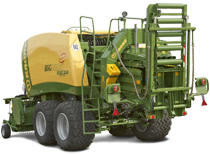 Use Krone’s innovation to find new profit centres in the small bale market for your business.